Light: Teaching or guiding others. Searching for the truth. Asking for guidance from a higher power. Acknowledging the wisdom and experience of others. Taking vows. Engaging in heartfelt rituals. Volunteering. Shadow: Using experience as a means of manipulating or misguiding others. Being dogmatic. Favoring tradition over what is expedient or necessary. Going through the motions of empty rituals. Concealing wisdom. Restricting access to spiritual truths or the gods. Story: A skilled advisor or capable initiate teaches the main character the secrets he or she needs to succeed. Relationships. A relationship should be more than just going through the motions. Seek the deeper meaning of small gestures and daily chores. Emphasize signs that those involved have real faith in the partnership. If necessary, seek guidance from a spiritual leader or counselor. Work. Seek training or a mentor, particularly if you are having difficulty understanding a complex assignment or when adjusting to new professional surroundings. See your daily work as an expression of your faith. Take traditional routes instead of innovative, unproven measures. Spirituality. See familiar spiritual symbols in a new light by pursuing a deeper understanding of them. If you’re a lone practitioner, consider the value of joining a like-minded group or learning from a worthy teacher. What are the larger truths behind the rituals or stories you’ve learned? Personal Growth. In time, everyone must deal with conflicts between experience and faith. Where do you find your personal center? Values dictate behavior, so work to define what you truly believe in. Don’t shy away from the big questions, but be wary of gurus bearing quick answers. Fortune Telling. Expect to be caught in a misdeed and punished accordingly. Pray for forgiveness and confess wrongdoings. A more experienced man, spiritual leader, or father figure will come into your life. The three-tiered hat. The three-tiered crown, called a triregnum or tiara, of the Pope dates to at least the thirteenth century. The number 3 suggests a connection with the trinity. How is your own faith (or lack of faith) reflected in this situation? The triple-cross scepter. The Papal Cross is widely recognized as a symbol of the Pope’s authority and office. Crowley’s version in the Thoth deck is said to represent three distinct eras, concluding with the age of Horus, in which old beliefs are abandoned. Are there outdated beliefs you’d do well to abandon? The kneeling acolytes. The acolytes or ministers wear robes adorned with roses and lilies in RWS-influenced decks, suggesting a connection with repressed male and female sexual energies. What urges or inclinations are you being called upon to control? The crossed keys. The crossed keys are associated with St. Peter, considered by some traditions to be the first pope. Jesus gave Peter the keys of the kingdom. If you were in a respected position of power, what changes would you make? The number 5. 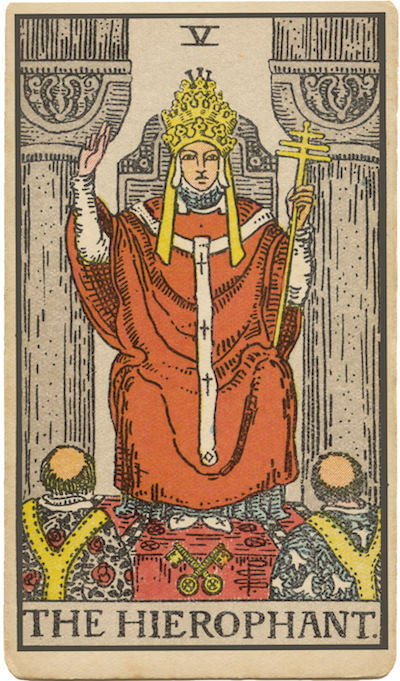 The five points of the Hierophant’s body (head, hands, feet) suggest an upright, five-pointed star. This upright pentagram places the head above the body, emphasizing the mind’s ability to force bodily urges into submission. Five, the number of the senses, is also the number of humanity. Which might your situation call for: your head or your humanity? What role might tradition or religion play in this situation? Who authored the rules? Who enforces them? Why? How might an experienced guide impact this situation?